Continuing our season of New Zealand based Guest Bloggers may I present multi-award winning author, and RWNZ president Lizzi Tremayne. Hello, all you readers and foodies out there! Suddenly hungry, her heart and body craving succour, Aleksandra reached for the zakwas sour rye culture and started a pot of żurek. Like the wheaten sourdough starter other pioneers in the West used to leaven their biscuits and breads, zakwas gave żurek, the traditional Polish comfort food, a unique taste when stewed with grilled kielbasa, bacon, potatoes, mushrooms, and sour cream. Nibbling at crispy shreds of the aromatic sausage as it cooked, she sighed with pleasure and began to smile again. This hearty stew, typical of the ‘sour’ soups common and beloved by many Eastern Europeans, is my favorite soup. It is well worth the time it takes to make it. Thank you to the Glinkowski family, third generation owners of Glinkowski Carriages, for sharing with us their love of Poland and Żurek. After leaving them, we tasted different versions of it in every town we visited around Polska. Mix in a nonreactive vessel (glass, stainless steel, stoneware) and leave in warm place (70-80 F / 20-27 C) to ferment for 2-5 days until bubbly and as sour as you wish, then use it to make żurek. The resulting culture: After I use some to make żurek, I refresh the rest by ‘feeding it’ more kibbled/cracked rye or rye flour and water, as Aleksandra’s mother did in the story. Leave out, covered, to ferment overnight then refrigerate. When it hasn’t been used for a while, liquid will accumulate on top and be less active. Stir it and replenish as above. With this starter, I can make żurek whenever I want and also use it as a starter in sourdough rye bread recipes. c=cup=250 ml liquid or dry, t=teaspoon=5 ml, T=tablespoon=15 ml. In large soup pot, brown chopped onion till translucent, then add bacon and cut up sausage. Stir-fry until browned (some prefer to prick sausages and cook them whole in the liquid soup, then cut up later). Add spices and boiling water or stock. Add zakwas, while whisking. This will thicken the soup. If you used oat flakes, you may wish to strain the zakwas but I don’t strain it, as I also use kibbled rye in my starter. They cook down, J. Bring to a boil and simmer for 10-15 minutes. If it has thickened enough, add the sour cream. If not, stir one tablespoon flour into the sour cream before adding, then bring to boil again and simmer for another 10-15 minutes. I make (at least) a double recipe, as it is better the next day or after freezing. To serve, ladle soup over potatoes and eggs placed into the bottom of individual bowls or make bread trenchers to use in their place! Cheat by horizontally cutting the top off of a large bun to create a lid (or cut a hole out of the top as you would a Jack O’Lantern pumpkin). Hollow the bread out and ladle the soup into it. Bon appétit, and good reading! Here’s a little about my debut novel. Book 2 in the series, The Hills of Gold Unchanging, will be out soon! Escaping her father’s killer, Aleksandra rode the Pony Express—full speed into the Indian Paiute War. Growing up in the 1860’s Old West, Aleksandra was trained in the Cossack arts by her father. Now she’s alone, running to prevent her pa’s killer from discovering their family secret. 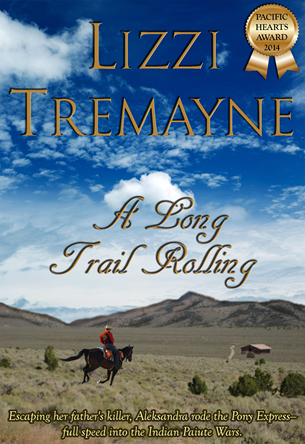 Disguised as a Pony Express rider in Utah Territory, she finds herself in even deeper trouble when she rides full speed into the middle of the Indian Paiute Wars. Her alluring Californio boss Xavier has a strength to match her own, but can they overcome the ever-increasing odds and evade the man who’s already killed Aleksandra’s father—and set his sights on her? Awards for this debut novel: Finalist 2013 RWNZ Great Beginnings; Winner 2014 RWNZ Pacific Hearts Award; Winner 2015 RWNZ Koru Award for Best First Novel plus third in Koru Long Novel section; and finalist in the 2015 Best Indie Book Award. A saga of the Old West with a multicultural cast of those who make up America, it would interest readers who enjoy sagas, horses, American Indians, immigrants, and the Pony Express. It has a capable heroine, strong historical detail, period veterinary treatment and frontier-pushing characters. It has been compared to the work of Phillipa Gregory, Diana Gabaldon and Jean Auel, with a little Laura Ingalls Wilder thrown in. The Series: This novel is the first in The Long Trail quadrilogy of historical adventure sagas following Aleksandra and Xavier from the wilderness of 1860 Utah to Colonial New Zealand. 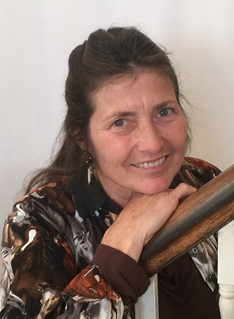 Author Biography: Lizzi grew up riding wild in the Santa Cruz Mountain redwoods, became an equine veterinarian at UC Davis School of Veterinary Medicine, practiced in the California Pony Express and Gold Country before emigrating to New Zealand. When not writing, she’s swinging a rapier or shooting a bow in medieval garb, riding, driving a carriage or playing on her farm, singing, or working as an equine veterinarian or science teacher. She is multiply published and awarded in special interest magazines and veterinary periodicals. multiply published and awarded in special interest magazines and veterinary periodicals. Author Links: You can read more about me and what I write, as well as contacting me at:!